Journal Of A Petite Diva: TRAINING! TRAINING!! TRAINING!!! So I got in contact with the guy who suggested the idea and asked him to organize it. He has been really hands on, he looked at different places and chose the one that was more professional. He was also in charge of printing the flyers. He has also been advising me on how to get the word out there for the event to be a success. One of my fears and one of the reasons why I initially debunked the idea the first time it was presented to me was because I am relatively new to the business but after my birthday and the mighty praise I got and super encouragement from people which was amazing. I even had guy friends who offered to spread the word via a radio program. I was like you guys really want me to do this. So I said, what the heck! What is the worst that can happen? 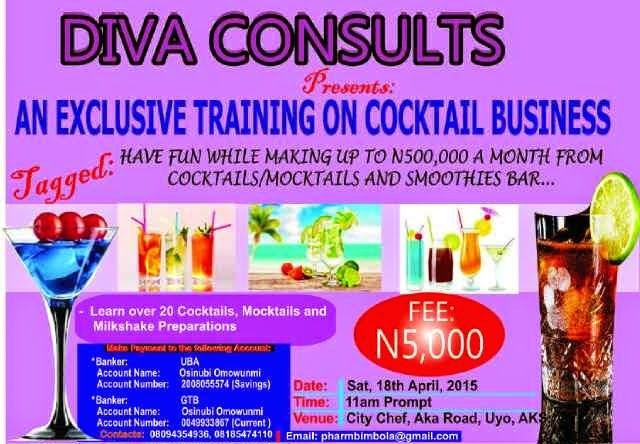 So Ladies and gentlemen, without further ado let me officially inform you about the cocktail training that is to be held in Uyo. The training is to be hosted by Moi and is organised by Abasifreke of Druginterface.wordpress.com. It is going to be held (by God’s Grace) on the 18th of April, 2015 at Citi Chef, Aka Road, Uyo. I am trying to make it an interactive session where the participants would carry out some practical by themselves (like in pharmacy school). Hopefully all that i planned would work out. I don’t know whether it would be a success or not but I do hope that I won’t be the only one there (that would be a disaster). Let me tell you guys the truth, having this training really scares me. After the venue was paid for, I almost called Abasifreke to tell him that I am not doing it again but I realised that success doesn’t come easy. I read that if your dreams don’t scare you then it is not big enough. So I am going to be a big girl and follow through with this plan. I hope I won’t faint from my fear (tiny) of public speaking. Hopefully the fact that half of the time is going to be spent on practicals which is fun and calming to me would help me completely forget that I am speaking in public. Here is the soft copy of the flyer. I still have some other things to do but everything seems to be working out. Even the drinks that I thought I would not be able to find in Uyo are appearing all of a sudden. 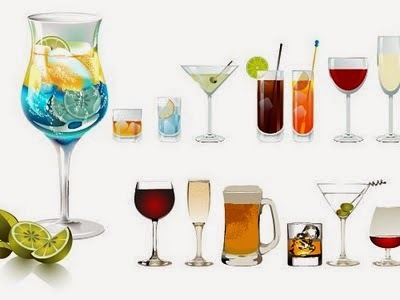 It seems because of me the supermarkets and wine shops are getting them….go figure. Please, please, please, please help me spread the word, i don't want to be the only one at the venue that day. Besides you guys are officially part of my advertising team....*winks* Thanks a lot. 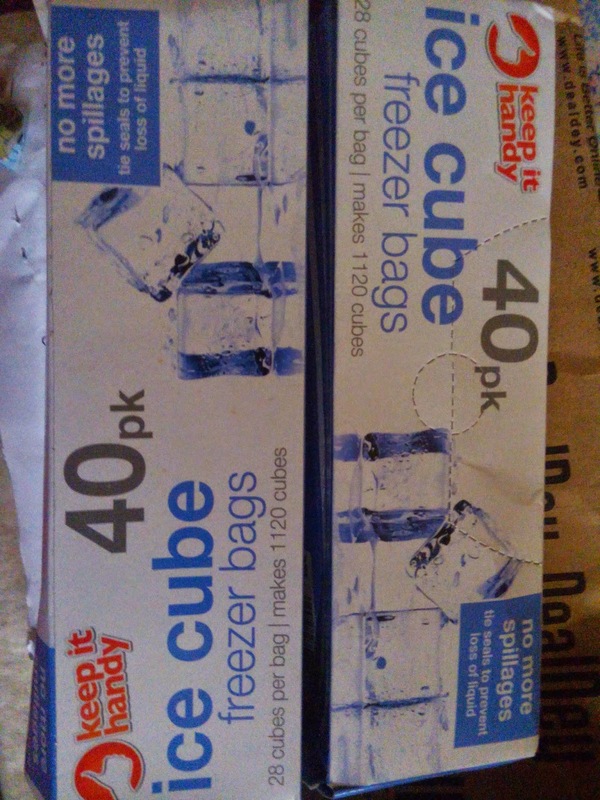 P.S: I finally received the ice cube bags that i have been looking for. I got it from dealdey.com. I would do a review of my experience with them. I had to get the freezer bags because apparently i have to make my own ice cubes here as nobody seems to be business savvy enough to dabble into ice cube making here in Uyo. Here is what they look like. Got them for 799 naira....yaaaayyy!